How do we situate ourselves in the network? What remains and what changes? What happens to the real body in this new scenario? The (Internet) link as geography, an online chat as a story, a mobile device app that augments our realities - this piece experiments with the movement and translation of information and ideas in today's NETWORK CULTURE. 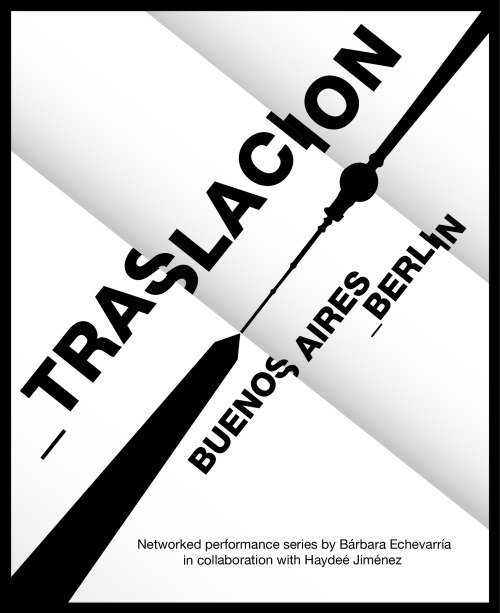 TRASLACION is a project directed by Bárbara Echevarría (Buenos Aires) in collaboration with Haydeé Jiménez (Berlín) in which a group of artists from various disciplines are invited to collaborate in the development of performative processes and installations that interweave technologies that transform/ transmit/ translate information into new artifacts. A series of happenings/events in Buenos Aires and Berlin will merge through technology, artistic processes and the internet. Each piece will form part of a networked project. The artistic processes and interactions with the audiences in each of the events in this series will form links; they will translate and transform everyday objects and rituals, geolocations, architectural spaces, perceptions and notions of distance, time and reality. Artists and audiences are invited to move and interpret their experiences within the network. Financial and any other kind of support for the production of the Berlin-Buenos Aires collaboration. We would like to have funds to pay all collaborators. Supporting Institutions in Berlin, Buenos Aires or Europe to be eligible for official sponsorship. If you have a cool tech-tool / app /technique that you are working on or would like to participate with in this project, we would love to collaborate with you to explore creative possibilities.